As you all are pulling your boats out of hibernation and getting them ready for the season, it’s important to give your boat a good visual inspection, both inside and out. Did you forget that it was damaged last year? Did something happen to it while it was being stored? Maybe you’ve already taken it for a spin and accidently damaged it? No matter what happened to your boat, if it does not look like that shiny, new beauty that you originally bought, then it’s time to bring it into Anchor Marine Repair. We are a boat repair shop in Minneapolis/St Paul and we are your closest boat repair experts around! As the Minnesota fishing opening gets closer, the time to perform much needed boat maintenance is dwindling. The countdown is on! So many fishing enthusiasts pull their beautiful boats out just days before the opening and are devastated to find major cracking, gouging, nicks and structural damage to their otherwise perfect boats. Don’t let that be you! Let our boat repair experts take a look at your baby and perform some much needed boat maintenance on it and get you back on the water just in time! Any structural damage? If you notice the cracking, nicks, and gouging right away, go ahead and call us! As you are looking, check for soft spots in the fiberglass. While it may not look like a problem now, without proper boat maintenance, it can cause a serious problem out on the water. How’s your trailer? Check the brake lights, running lights, and especially the tires! Losing a tire is actually pretty common after your trailer has been sitting in storage, but it can also be incredibly dangerous! Any small cosmetic issues? 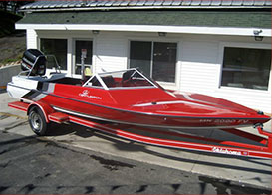 Our boat repair experts love to leave your boat looking pristine. We deal with both very large restorations and small repairs like tiny scratches and light touch-ups. Our Boat repair shop in Minneapolis/St Paul is the best around. We offer free pickup and delivery for anyone within 250 miles of Minneapolis and St Paul. If your boat has been damaged in any way, it’s important to let the boat repair experts at Anchor Marine Repair take a look and get you back on the water before the big fishing opener. For more information on our boat repair and restoration, give us a call today at 763-972-3540 or email us at service@anchormarinerepair.com.